Some honesty from Bolivian president Evo Morales. Bet he never said this before he was elected. 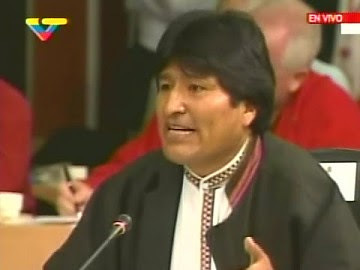 April 16, 2009 – During his intervention at the seventh ALBA Summit, Bolivia's president Evo Morales recalled the 1962 documents of the Organisation of American States (OAS) that resulted in Cuba being expelled from the organisation, and outlined the importance of reflecting on the motives of that expulsion. The resolution indicates that the adherence of any member country to Marxism-Leninism, and the association of any member government of the organisation with the communist bloc, broke the unity and solidarity of the hemisphere. Therefore, given that the government of Cuba identified itself as Marxist-Leninist, it was incompatible with the purpose of the OAS and was therefore excluded from participating. “Cuba was expelled for being Leninist, Marxist, communist. I want to say to the members of the OAS, here, I want to declare myself Marxist, Leninist, communist, socialist and now let them expel me, I want them to expel me from the OAS. It is unbelievable that for being Marxist-Leninist one can be expelled from the OAS”, exclaimed Morales. "Bolivian President Finally Admits What We've Long Known "
Actually, I think the people who voted for a guy from a party called 'Movement Towards Socialism' might have had an inkling, Trev.